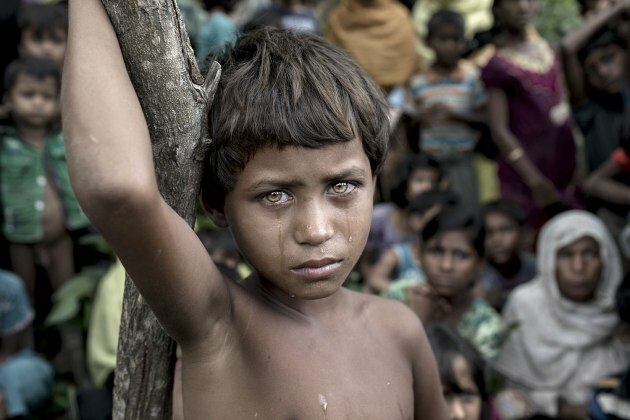 Selected from more than 48,000 entries, an image of a young refugee - a traumatized Rohingya girl - has been declared the overall winner of the 2018 Siena International Photo Awards (SIPA) contest. The photo, titled “Battle Victim”, was shot by documentary photographer K M Asad. The Bangladeshi photographer beat entrants from 156 countries to scoop the title of SIPAContest Photographer of the Year 2018. K M Asad captured this moment of a Rohingya refugee girl in the Thankhali refugee camp in Teknaf, Cox’s Bazar. She looks on at newly arrived refugees who fled to Bangladesh from Myanmar. TariqZaidi, a freelance photographer based out of London, UK, represented by Zuma Press (USA) and Getty Images (UK), won the prestigious title of “Best Author 2018”, thanks to his powerful stories from Congo, North Korea, Brazil and Sudan. In Travel & Adventures, Zac Lowry’s striking image shows a man running through a checkpoint carrying his injured son in West Mosul, Iraq. British documentary photographer David Chancellor came in first in Storyboard with an impressive series, documenting how, in Africa, trophy hunting is a big draw for rich tourists who are able to pay big money to kill animals for sport. His work examines mankind’s commodification of wildlife. Francisco Negroni, Chile, placed first in the Nature category for flashes of lightning that lacerate the sky while the glow from molten lava lights up the billowing smoke. The Wildlife category was won by Amos Nachoum, Israel, for a shocking image which shows a leopard seal getting into a lagoon just before he catches a penguin by its feet, dragging it into the open water. Klaus Lenzen, Germany, placed first in the General Color category with a picture taken in summer 2017 during a triathlon competition in the Duesseldorf Media Harbour; Sina Falker, Germany, placed first in “Splash of Colors,” the Special category for 2018, with a photo taken early in the morning before sunrise, where boats meet at the colorful Lok Baintan Floating Market in Indonesia; and Marcel van Balken, the Netherlands, placed first in the Monochrome category for a photo which highlights the modern architecture of Arnhem Central Station in the Netherlands. The People & Portrait category was won by David Nam Lip Lee, Malaysia, with a stunning image of a child of the Suri tribe in Ethiopia standing among traditional metal handcrafts. Fyodor Savintsev, Russia, won Architecture with a picture of some Russian dachas near the city of Arkhangelsk, just after an intense snowfall. The Spanish photographer Ajuriaguerra Saiz Pedro Luis came in first in the Sport category for an amazing image catching a pole vaulter’s reflection as he made his final jump. Finally the Under 20 prize went to Chinese photographer, Yinzhi Pan, for his beautifully detailed shot of a young fisherman captured at Inle Lake, Shan Plateau, Myanmar.